EVERYONE LOVES CLIFFORD -JUST EVERYONE! 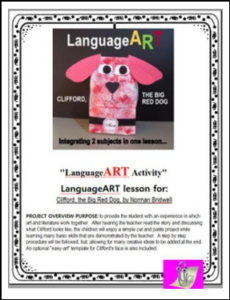 And this free lesson, “CLIFFORD, THE BIG RED DOG CRAFTIVITY…AFTER READING THE STORY”, provides the primary age children with an introductory experience in my LanguageART approach to teaching…in which art and literature work together. After hearing the teacher read the story of Clifford, the Big Red Dog, and discussing the story, the students will then enjoy a simple cut and paste project. They will learn many basic art skills, have a chance to add creative details of their own, and of course have fun! This project can be used in the art room, classroom, or as a home school activity. These links will explain the LanguageART approach in detail, and show you a reduced price bundle of Clifford products. Please take a minute to rate this product, or just press green star to follow me.